Casa B hits the right mix of home and away. 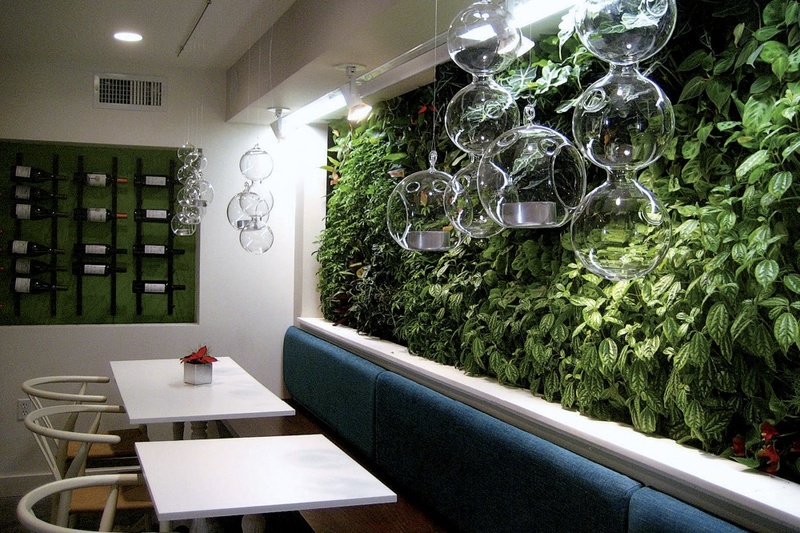 Casa B’s living wall of greenery sets a homegrown tone in the lower dining room. Somerville’s Union Square, long viewed by many as an unwholesome tangle of car traffic, has lately emerged as something of a foodies’ haven. Distinctive, locally owned restaurants abound, ranging from the supper-club milieu of Journeyman (try the fresh cocktails at its sister establishment, Backbar) to the vivacious Cantina La Mexicana, the Peruvian outpost Machu Picchu, and the funky Bloc 11 Café (wrought from an elegant old bank building). Eating at home? The square offers homemade pasta at Capone Foods, or you can trot over to the jam-packed Reliable Market for a selection of Korean and Japanese foods. Sherman Market has locally sourced cheeses and produce, while the ever-expanding Saturday farmers’ market runs from June 2 through November 17. Among the newcomers to this eclectic eating scene is Casa B. Chef-owners Alberto Cabré and Angelina Jockovich are from Puerto Rico and Colombia, respectively, and combine their countries’ flavors in innovative tapas. One salad, for example, offered boiled yucca marinated in a cilantro vinaigrette, served with red peppers marinated in farmer’s cheese, along with a generous dose of cilantro micro-greens ($13). On top, a soft-boiled egg’s rich yolk brought the ingredients together, while a splash of balsamic vinegar lent a needed sharp note. Another pleasure was the dish of earthy wild mushrooms (oyster and enoki) on grilled disks of sweet white potato that were enlivened by a peppery sauce ($7). The crispy avocado rolls ($7) were made of a bland dough wrapped around nothing we could discern. But the accompanying glossy prune and cilantro sauce (who thought of that?) was inspired. Also delicious were the heavier tapas. The tender mound of Puerto Rican pot roast and crispy yet succulent yucca gnocchi were served in a dreamy sage and brown-butter sauce ($15). The seared tuna ($12), perfectly cooked and adorned with sesame oil and seeds, had a nutty depth that paired well with knobs of deeply sautéed sweet plantains and the side dollop of wasabi aioli. The plantains paved the way for dessert. The lime pie ($10), with tasteless crust but tangy-enough filling, was overshadowed by the accompanying dainty glass of dark rum mojito granita—a marvelously complex, minty mouthful. The budín de coco y chocolate—a coconut and chocolate bread pudding ($10), served with swirls of crimson guava sauce—was heavenly: an exquisitely made, custard-like Almond Joy with plenty of crunchy toasted coconut flakes. The small, two-level restaurant was designed by the owners, both former architects. Cool shades of white predominate upstairs, and fresh, colorful accents downstairs, like peacock blue (a Victorian sofa by the tiny bar) and greens (an entire wall of live plants growing horizontally, fed by lights that run from 3 a.m. to 3 p.m.). Look for other ingenious touches, like the stairway wall clad in beautiful old wooden doors painted white. The lower level (it never feels like a basement) also holds the open kitchen, with a counter and stools where people eat, as well as tables. A charming, homey feeling prevails amid all these dishes and wines and many patrons from Spain and Latin America. This merging of casa and afar, paying homage to origins, is intentional. “The restaurant is named for my maternal grandfather, Ernesto Bobonis,” says Cabré. “He exposed me to food and basically made me enjoy bringing people together to enjoy food and each other.” Here, that spirit is alive and well.